Gianni Rotondo, Royal Caribbean's general manager in Italy is happy with the recent numbers the cruise line has seen in the country. "The January-March quarter saw an increase in passengers by 20%, with an 8% increase in average revenue, "says Rotondo, noting an increase in price as a customer's propensity to choose the more expensive cabins. "In 2013, we exceeded the levels of profitability by not only 2012 but in 2011, recording the highest margin ever in Italy." While still in winter, Royal Caribbean Italy is already looking ahead to the summer season and has launched a new promotion called "Room with a discount", which returns after a good showing last year. With eight ships sailing in and around Italy, Royal Caribbean is expected to bring about 1.5 million tourists to Italy in 2013. The ports of Civitavecchia (Rome), Venice, Genoa and Naples will all see Royal Caribbean cruise ships stop by. The amount of passengers coming to Italy in 2013 is up 18% from the year before. The port of Civitavecchia will see the most traffic. Royal Caribbean director general for Italy, Gianni Rotondo, commented on the increase in cruise traffic, "In 2013, Royal Caribbean began with encouraging results and now we are about to enter a period full of novelty and change. With the arrival of three new ships in Italy and the addition of Naples in the Italian ports of embarkation, we are closer to the goal of improving and diversifying what we offer in the area." "Italy is undoubtedly a strategic country for Royal Caribbean: the cities of art, sailing routes and the beaches of southern Italy are all a strong call for cruise passengers who want to spend a holiday exploring the local cultural heritage without giving up on fun and relaxation. " In all, 14 cruise ships will visit Italy, including Liberty of the Seas, which will be the largest of Royal Caribbean's ships cruising the Mediterranean. The number includes some of sister company Celebrity Cruise ships as well. In Italy, there's also reason to be excited for 2014 because Oasis of the Seas will sail Italian waters for the first time ever, as part of a short European season. Royal Caribbean Italy general director Gianni Rotondo says that Naples, Italy plays a strategic role in Royal Caribbean's 2013 cruise plans with 84 ports of call, which will bring more than 250,000 cruise passengers through the city. Liberty of the Seas will be one of four Royal Caribbean ships to call on Naples this year. In 2014, Naples will be a port of call when Oasis of the Seas arrives for a short European cruise season as well. All of this is "a great opportunity for the city in terms of economic return and tourism development." The company has bet their cruise strategy on Naples, in the belief that "the whole South of Italy", said Rotondo, "has great potential and we hope to increase more and more our presence in the area thanks to the significant synergies with the local authorities" . 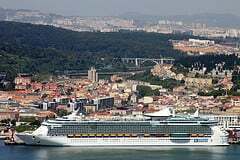 Through August 30 guests aboard Liberty of the Seas can take a seven-day cruise with stops in Barcelona (Spain), Toulon (France), Villefranche (France), La Spezia, Civitavecchia and return to Naples. Royal Caribbean has seen its growth in the Italian cruise market triple in the last two years. Despite stiff competition by Costa and MSC, Royal Caribbean has managed to experience significant growth. Royal Caribbean General Manager for Italy, Gianni Rotondo, commented on the news, "In two years we have invested a lot in Italy and we have gone from 23 thousand to 70 thousand Italians on board." Rotondo also mentioned that Italy is the number one country in Europe for transit and Royal Caribbean accounts for 7-8% of the domestic market accounts. In terms of the effect the Costa Concordia disaster has had, Rotondo noted that "we have lost something on the average income per person is an average decline of about 10 percent." While the average cruise fare has fallen, Royal Caribbean has managed to see "a simultaneous increase of 300 percent of the customers". Royal Caribbean CEO Adam Goldstein spoke in Milan, Italy yesterday about new investments, ships, airports and important partnerships. "For years Italy has played a strategic role in the planning of Royal Caribbean International: Since 2005 we have more than doubled the ports of embarkation in the area, adding to Civitavecchia and Venice also Genoa, Messina and Naples. The arrival of a ship like Liberty of the Seas, which next season will embark from the port of Naples, confirms the company's commitment towards the Italian market, " Goldstein said. " 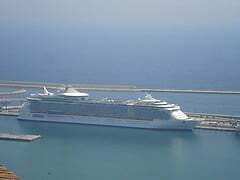 Even in 2013 Royal Caribbean International will pay particular regard to Italian guests with a special offer on board: from excursions, offering food and beverage, staff of dedicated service, all in an international environment that meets the needs of Italian. " Coinciding with Goldstein was the debut of two new Royal Caribbean ships in Italy. Liberty of the Seas will go toItaly for the first time and offer 7-night cruises out of Naples to the Western Caribbean while Legend of the Seas will take the place of Mariner of the Seas and offer 7-night Western Mediterranean cruises out of Civitavecchia and from Genoa to France and Spain. "The ships dedicated to the Italian market in 2013 are the most innovative in the fleet," adds John Rotondo, CEO of Royal Caribbean, Italy "In 2013 there will be 5 ports of embarkation and 13 ports of call in Italy for four ships of the fleet Royal Caribbean International, for a total of 18 ports, 330 airports and more than 850,000 passenger movements, a further indication of the fact that Italy is a very important basin for. " Royal Caribbean has increased its focus on the Italy cruise market, with an emphasis in Genoa. An interview was published recently with the new Royal Caribbean commercial manager for Italy, Mario Paquero. 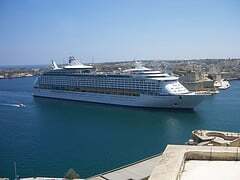 The tragedy of Costa Concordia has strongly affected the entire national market for cruises. You ever expect to have a problem like that? "We have always believed you could do great numbers, even if there were a couple of months rather difficult for everyone. But things quickly changed and bookings for the current season have gone beyond our expectations. If we also consider the difficult time of global economic crisis this represents for us an even greater success. " How was it possible to reverse this trend? "The company has decided to hold rates quite low given the high quality that will still offer the tourist. And then, for that matter, in the cruise price is really all inclusive, those who get on board our ships must not pull out a dollar for extras. " 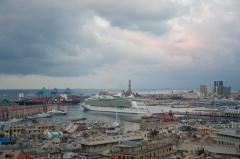 And in Genoa, which are the next steps of Royal Caribbean? "First, we plan to increase the number of our direct employees because the company believes very much in the Italian market and the future we hope to witness a fast and progressive growth of the group. Not only that, but from an operational standpoint, the port of Genoa will be reconfirmed as one of the major airports across the country. " The relationship between the city and the cruise is not always positive: closed shops, a few attractions, little assistance to visitors. You who give judgment? "I do not think this is true. For our part we have been from the beginning excellent relations with local government, the Port Authority and more generally with all the components of the economic fabric of the city that have supported our investments. By tourists, then there is a high rating to the city and the judgments that have emerged from our evaluation boards are more than good. Of course things can still improve and by the Royal's best efforts to make this happen through a constant dialogue with the institutions and associations. " Not only Genoa: Your company also believes strongly in the port of La Spezia. "The port of La Spezia is indisputably a major arrival point for our ships. And this for the extraordinary opportunity offered by the territory, rich in culture, natural beauty and geographically strategic with respect to the most important and famous Italian art cities. " The cruise market, filed in 2012, will continue to grow? "The feeling we have right now are positive although it is impossible to predict long-term. The index to the holidays of this type, however, increases from year to year. And this happens not only in the Mediterranean but also throughout the rest of the world. " The inaugural sailing of Royal Caribbean's Mariner of the Seas sets sail today in Civitavecchia, Italy for the Mediterranean. Royal Caribbean has organized a big party on board with a special gues ice skating world champion Carolina Kostner, who will perform on the ice rink inside the cruise ship. Just to emphasize the '' Italian 'cruise for 14 weeks will sail the waters of the Mediterranean, Royal Caribbean has adopted a philosophy of "Italian friendly", offering food and hospitality "Italian." On board the ship, there will be European soccer matches projected on a big screen. Royal Caribbean's Navigator of the Seas will homeport in Messina this summer and the mayor officially welcomed the new ship. At a ceremony this morning, Messina Mayor Giuseppe Buzzanca celebrated the occasion along with the Commissioner of the Port Authority, Dario Lo Bosco, and the Director General of Royal Caribbean Cruises John Rotondo. The choice by Royal Caribbean of Messina confirmed the strengthening of the commitment on the peninsula and the eye towards the markets of southern Italy, allowing Royal Caribbean to serve 14 ports in Italy.